Until then, how about a very sweet card? :-) A simple design, barely any stamping. I purchased some Crate paper (this design is called Crush) from Eclectic Paperie (ps - don't they just have the best stamping stuff??) a few weeks ago and have barely been able to put it down. This card is a combination of a few of those papers (the tag and polka dotted pieces) and a piece from my other favorite paper designer, Amy Butler. How about the cool velvet ribbon? Also from Crate paper, you get a bunch of darling spools of ribbon on a giant ring that coordinates with the paper! Oh my spinning head!! The "so very" and "sweet" words are from a retired SU! set, So Very. This piece came together quickly but then I sat there and looked at the separate parts (I tend to create as I go, alternating pieces of cardstock, ribbon, etc. on the card base until I find a design I like) but I just wasn't satisfied; something was missing. So I let the card sit overnight and the next night spied my giant primas on my counter and thought...ah...the perfect fit. Another card was complete! This was created for a swap I participated in last month. The idea for this card was cased from someone (I really need to write names down when I randomly case!) on SCS. I've seen a bunch of cards using SU! 's Pick a Petal stamp set to create the shell of a ladybug. How clever is that! The card base is Chocolate Chip and the Pumpkin Pie cardstock has been run through my Cuttlebug. The circles on the white strip is from the same SU! set. The ladybug was created by using a circle punch for the body and half a circle for the head. I drew in antenna and used brads for the little doo-dads (that's a technical term) at the top. I used two colors for the wings; So Saffron in the center and Pumpkin Pie on the edges. I then dry embossed the back of the wings on a mouse pad to give them a slight curve and attached them on top of the "body" with stampin' dimensionals. The dotted trail is from a Papertreyink set and the sentiment from one of my favorite SU! sayings set. Enjoy and be sure to check back often next week!! Circle, sentiment, and ladybug images by Stampin' Up! Cardstock, ink, and brads by Stampin' Up! A sympathy card I created for the husband of a work associate who recently passed away after. 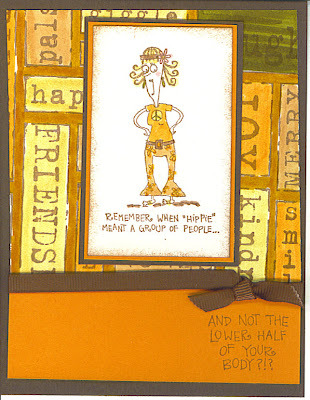 The idea for this card was taken from a creation by Debbie Olson, who posted this amazing card using SU! 's new Basic Grey paper. I didn't have any of the SU! paper but I did manage to find a beautiful piece of dark grey, lightly textured (think linen) paper in my stash that worked perfectly. Saw an amazing card and idea on Emilia's blog (Weekend Stamper, Happy Emilia) a few days ago and had to try it out! She created the look of a painted canvas by wrapping cardstock around a piece of cardboard. Just amazing! Since I was in need of a birthday card, I thought it would be a fine time to try out this technique. I used a retired SU! image, which I thought looked like a mini painting. Used my SU! markers to color the image and once again tried my hand at layering and shading. It's getting a bit easier and the effects are better but it really does seem to take practice. Love the end result though! I used watercolor paper for my image and then found a thick piece of cardboard to wrap the paper around. It really does look like a mini canvas in person, just love it! Will use this technique again and again! The image was then mounted on top of four scalloped rectangles that I secured together to create a rectangle large enough for the image. The background of my card is lightly stamped with a antique cracked and canvas background stamps to give it that nice antique look, which suited the image of the New England type colonial home. I found a piece of already stamped and aged twill that was the perfect size and look for the card. It wasn't long enough to tie in a bow or knot or I secured the ends with a piece of Hodgepodge Hardware by poking the end of the circle through the twill and twisting until it was resting in a visually appealing position. I then simply added the sentiment to a piece of cardstock punched with a SU! word punch. Voila! All supplies by Stampin' Up! Some images have been retired. Recently received the latest edition of Stampin' Up! 's "On Stage" magazine, which features contest winners, top demonstrator stories, and promotions and really loved one of the cards included in the magazine. I was in need of a "Thinking of You" card late one night last week, when the brain sometimes just doesn't want to think, so I decided a CASE was in order! Super easy card to make, really like this layout, although there are so many layers of cardstock that the front of the card is actually heavy! ;-) I used some of SU! 's new In Color cardstock and inks for this card. The base of the card is Purely Pomegranate and there are layers of River Rock, which looks quite green in the picture, and Very Vanilla. The edges of all the paper has been distressed with my handy dandy distressing tool and sponged with Basic Brown ink for some good 'ol aging. The floral background image was stamped in Wild Wasabi ink and then lightly covered with a Creamy Caramel layer of the Canvas background stamp, creating more of that worn look. The main floral image is from SU! 's Heartfelt Greetings set and was stamped using the same In Color colors. Added some paper piercing, faux stitching, and ribbon to complete the look! Wanted to take out my Just Johanna stamps a few days ago to play with them a little more...This cake image has always made me think of a wedding cake so I thought I'd use the stamp to create a few wedding themed cards. Here are the two I came up with! Both cards are very easy designs and both have the image stamped and embossed on vellum. The top card also includes my favorite swirly image from one my new SU! stamp sets in the background, which is embossed in silver. The cake image is embossed in white, cut out, and adhered with stampin' dimensionals. I like that you can see the swirls through the cake. :-) I then added a chipboard circle to the top. The circle has been covered with white cardstock, the edges embossed with silver, and a "Mr. & Mrs." sentiment, which didn't photograph that well, added to the circle. A bit of silver cording and this baby was done! The second card was even easier as I simply stamped and embossed, in silver, the cake image, and adhered it with silver eyelets. The "cherish" sentiment was stamped on a plain oval and embossed. Swirl and sentiment images, ink, chipboard, and cord by Stampin' Up! 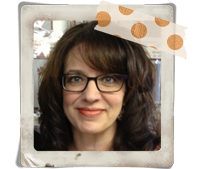 Julie over at Stampin' with Julie nominated me! Thank you so much Julie, I'm humbled. 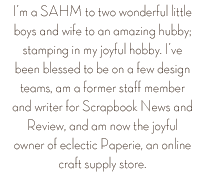 I started my blog to simply share and "get to know" others out there in the stamping world. Not only have I been able to do that but some wonderful friendships have been created and for that I am truly blessed. There are so many more....check out the links on the right hand side of my blog for more talented artists! More cards to follow over the weekend so check back in! A link from Allison's blog (Stampin' When I Can) sent me to a site I've never visited, Card Positioning Systems, where they post layout challenges. The challenge for this week was to use circles! I thought the layout was different and fun so I decided to play along! Some folks, who participated in the challenge, did use just circles as the entire card but since the patterened paper I wanted to use was a light weight I decided to go with a square background of a heavier cardstock. The card is 5" x 5" and the background color is one of the new SU! In Colors, River Rock. The rest of the paper is from my giant book of ProvoCraft paper. The corners are again covered using my favorite corner covering technique (using a scalloped heart punch) and adhered with snazzy new crystal brads from SU!. The middle flower and three dots have been sponged with River Rock ink and coated with one coast of glassy glaze embossing powder, giving it more of a rough bumpy surface vs. a high gloss smooth finish. Try out a circle card today and post a link back to your photo...I'd love to see what you create! I recently received a package from Eclectic Paperie (some amazing Crate Paper! I'll share a project using that paper later this week) and the sweet owners of the store, Daisy and Joy, included two stamped images for me to use on future projects! How fab is that?? This card took me outside of my comfort zone, which may seem odd since it's a fairly simple card. But I don't usually use this type of cartoony image...never seem to know what to do with them...and I don't usually use images that require coloring. (Although with all the "Copic Marker" discussion going on lately, I think I'm going to have to jump on the coloring bandwagon!) I decided to be even more daring and use bright colors, another item I don' t typically use in my projects. I read on Michelle's site (Mish Mash) a few days ago about drawing a line to resemble the ground on images that seem like they need to "sit" on something, rather than them floating in space. This tip certainly helped with this card! I also sponged on some green and blue ink to represent the grass and sky. The polka dots on the boot were created with the end of a paint brush and I added just a hit of "dirt" on the bottom of the boot. Since I had decided to go with a birthday sentiment, I added the tiny hat image from the same "Small Sayings" SU! stamp set to my hedgehog's head. Once my image was complete I mounted it on the blue patterend paper, which came from an SU! Stampin' Kit. I toyed with adding more paper, etc. to the background but decided that the blue paper looked really nice on **gasp** plain white paper! I simply added the narrow yellow trim around the blue paper, which are stickers from the same Stampin' Kit. Well for such a simple card, this was quite a long explanation!! Enjoy and happy creating! The layout for both pages started from sketches I found on Splitcoast but both designs were significantly altered by the time I finished. Outside of the time required to cut out the letters, everything else was fairly straight-forward and simple. I do actually plan on adding pictures to these pages, just haven't gotten around to it yet! Below are close up photos of the two individual pages. Hope everyone has a safe and cool summer week...and happy creating! Tracy over at Stampingly Creative Art tagged me to share seven things about myself. Humm...I'm not sure there's a lot of interesting info to share but how about some obscure and silly things? About 10 years ago I was seriously bitten by a friend's 150 pd. Bullmastif dog. It was nasty...the dog was nasty! I'm now very cautious about large dogs, which I never was before. Maybe that explains my bear fear...I don't want to get bitten by any animal larger than a mosquito! I played the flute throughout junior high and high school and was in the marching and concert bands. Still have the flute and pull it out every now and then but, like French, I don't remember much! I adore Seinfeld....Have most of the shows on tape and confess that I use lines from the show on a regular basis! I used to sing in a church choir and was once even in a concert where I managed to completely forget the words to my big solo!! LOL! That's it! I won't tag anyone since it seems most folks have done this already but if you haven't and want to share, please do, and leave me a comment with a link back to your blog! Enjoy the weekend!! This was a simple 6x6 layout, using SU! 's Always Artichoke as a base for the page. No stamping on this page either! I simply used the patterned paper found in my new jumbo paper pack, which BTW, consists of six different color/pattern families that all coordinate, to add a few layers. The polka dot strip and letters are stickers, which were also included with the paper pack. What fun! The large bracket is from a selection of SU! chipboard that I covered with striped paper. Just added a few of those fancy fun photo corners, secured by brads, on the other side of the page to balance the bracket. Of course I aged the edge of everything because that is absolutely my favorite technique! Always Artichoke and Sahara Sand cardstock, chipboard, and brads by Stampin' Up! Another card using my Just Johanna stamps. When I originally considered ordering some of Johanna's designs I wasn't sure I'd be able to pull off cards with the small images. I thought I would purchase a few stamps to challange myself to work with a stamp size I'm not typically comfortable using. I'm finding that I love her stamps and since it seems I am managing to come up some palatable designs, I now think I *gasp* might need more stamps!! LOL! My thoughts for this card was that there are lots of ordinary "chicks" (aka as birds for my card! hee hee) out there but close friends are extra special...hence my fancy little chick with her lovely hat! The dimension of this card has not photographed well but all of the birds are sitting on some dimensional tape, which pops them off the card, and the sentiment has been embossed on a mousepad to give it some dimension as well. The birds were colored with watercolor pencils. I'll need to play around a bit more with my JJ stamps but I'm really enjoying them!! They're so darn fun! Base cardstock, ink, watercolor pencils by Stampin' Up! Wanted to bring some attention to an upcoming crop, being held in CA, to raise donations for The Unforgettables Foundation. The Foundation is a non-profit charity that raises money to help grieving families with expenses after a child has died. This is going to be a large two-day event with raffles for amazing prizes (the big prize is a free photo shoot with Tara Whitney, who is a fantastic photographer) and lots of scrapbooking! You can view full details at Karen Wilson's blog but here are the basics: Date: January 26, 2008 9:30 a.m. - January 27, 2008 2:00 a.m. Cost: $100 per scrapbooker + a donation of at least $100 for TUF (prizes for the higest donations will be awarded!) Cost covers 2 meals, t-shirt, goodie bag & more! Lots of opportunity drawings will be held to win retreat weekends with friends - and so much more! Location: Redlands, California Contact: Karen Wilson - theunforgettablesfoundation@verizon.net if you would like to register or sponsor our event. Availability: 200 crop spaces Fundraising Goal: $50,000Please visit our website for more information about what we do to help grieving families after the death of their child. http://www.theunforgettables.com/ I'm talking with one of my local scrapbooking stores to see if they'd like to host a smaller one-day event. I'll provide more details as those plans solidify. I can hardly imagine the pain associated with losing a child, it makes me weep to even consider it. While nothing could ease such the ache that would come from losing a child, this, at the very least, is a way to help alleviate some of the financial burden. So if you live in the Redlands (and hopefully New England) areas, consider signing up, donating, or participating in some way! This card was created with some of my favorite stamps from Papertreyink. One of the things I love about acrylic stamps is that you can alter the layout of an image. The "blessed" sentiment has been bend to fit the circle. The patterend paper is by Basic Grey and the circle heart is a piece of chipboard covered with more Basic Grey paper. The darker green cardstock (Always Artichoke) is by Stampin' Up! and is one of my favorite colors. Notice that little piece of ribbon? Perfect for covering up a small mistake! **giggle** I got a little crazy with my paper piercing and ended up with a few holes too close together. Ah, ribbon, the perfect solution! Ribbon, brads, chipboard, plain cardstock by Stampin' Up! A simple card that I quickly put together for a family member who recently underwent open heart surgery. I chose the word "grateful" vs. something along the lines of "get well" as we wanted to express that we were grateful God granted her a successful and uneventful surgery! A card for a vendor friend of mine who tirelessly worked with one of my more "high end" clients on their big trade show. The show theme? Time to Meet Your New Cash Cow...that's right, we had huge 10' long inflatable cows hanging from the ceiling! It was quite a sight! This was the perfect image and sentiment for her thank you card. This is another retired SU! set, that I don't actually own, but my good friend (who happens to live next store and be my stamping buddy) does! "Bessie" is stamped on watercolor paper and colored with SU! markers. I also masked the image and very lightly added some Bashful Blue and Saraha Sand ink to the background. The floral and grey papers are from Basic Grey. I created the large scalloped rectangle by punching out four rectangles with my Marvy Giga punch and overlapping them until I had the right size for the image. Because the background paper has a pattern to it, you can't even see the seams. I then pierced each scallop for a little extra something. The BG paper is mounted onto a burgandy paper that was run through my Cuttlebug and very lightly rubbed with a silver ink. The entire piece is mounted on a Sahara Sand pre-folded card that has been stamped with a canvas background. Three black brads and a small piece of light pink ribbon were added for some extra "umph." Stamps, plain paper, ribbon, brads, and markers by Stampin' Up! I thought I'd do my best to bring back the colors of my parents kitchen during the 70's for the card colors. I think I nailed it! The word background stamp, usually just stamped in black, was colored with SU! markers. I confess that coloring in the blocks was not my original idea but found on some cards on the Splitcoast site. My hippy girl was stamped in black on vanilla cardstock and colored with markers. Simple card but oh so fun to share! Haven't had much time to play with my new Stampin' Up! sets but this is a card I managed to make last week. Completely in love with the giant swirl image that comes with this set. It makes a wonderful background design. The background and saying is stamped in the same color green as the cardstock for a subtle effect. The strip of red cardstock was creating using a faux suede technique. You need to use cardstock that is died all the way through (no white core) for this effect. SU! cardstock is perfect because it's not only died all the way through but it's also got a really good weight to it. If you really crumble up the cardstock, really smoosh it, you'll be able to pull the layers apart. The middle of the paper will resemble suede. Fun! The middle design was created by simply stamping each section and cutting out the design. Each part is layered and I'm using the new SU! In Color inks and cardstock. A few eyelets and silver cording finishes off this one! Stamps, ink, cardstock, and embellishments by Stampin' Up!